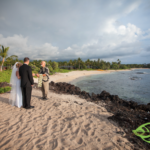 A beautiful wedding at Kukio Beach at Kikaua Point. 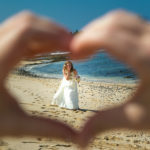 This intimate wedding was coordinated by Jots of Thoughts Weddings and Events. Kahu Tom performed the ceremony which started with an oli or chant as the bride started down the aisle. 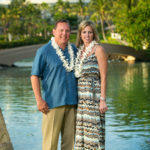 The couple exchanged leis and had a special ring blessing with salt water.